McLean Youth Volleyball follows the official United States Volleyball (USAV) rulebook. Some variances are made for the House leagues to foster more equitable games and encourage learning. Extra point awarded for any multi-touch combination leading to an immediate win. 4th & 5th requires any 2 touches while 6th is any 3 touches. The referee calls a captains meeting within 5 minutes of the scheduled start time of each match. 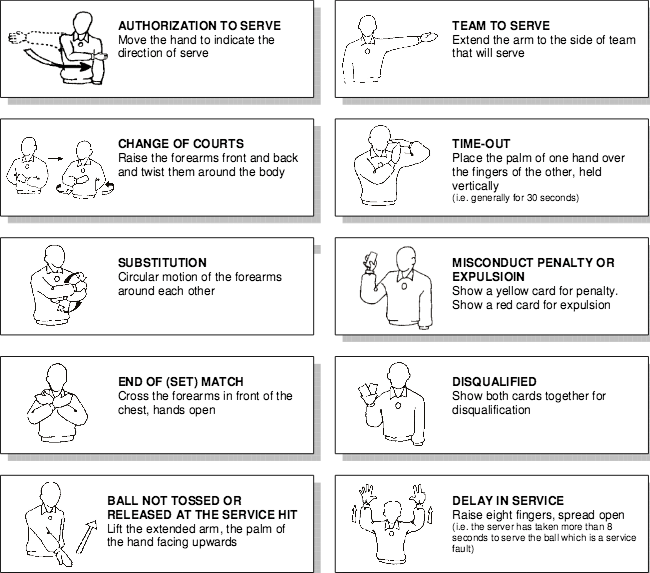 At the start of each set, players go directly to their positions on the court without directions from the referee. Each team is allowed two (2) time-outs per set. Time-outs last no more than 30 seconds. After the last set of the match completes, the referee signals both teams to the baseline. Subsequently, the referee signals the teams forward to shake hands at the net. All players and coaches are expected to participate. Failure to participate violates the sportsmanship rules outlined in the Code of Conduct that each player and coach agree to when registering with MYA Volleyball. Each team is entitled to a maximum of 3 touches to return the ball to the opponent. A player may not double contact the ball except for the first contact. A block of the ball at the net does NOT count as one of your three contacts and the blocker can touch the ball again after the block. Contact with the net between the antennae by a player during the action of playing the ball is a fault. A ball touching the antennae is a fault. If during a volley, the ball hits the rolled-up gym divider, rafters, ductwork, or ceiling, and comes back to the team that hit it, they may continue to play it, as long as they are still within their 3 hit maximum. If during a service, the ball hits the rolled-up gym divider, rafters, ductwork, or ceiling, it is out-of-bounds. All basketball backboards, rims, and anchoring equipment attaching them to the ceiling are out-of-bounds. If the backboards are raised, they become part of the ceiling and balls touching them are playable. Walls, deployed court partitions and bleachers are out-of-bounds. The rest of the gym is considered playable. During game play, coaches may stand on the sideline with the rest of their team and give instructions to players, but cannot distract, disturb or delay the game. A coach who purposely delays the game to gain an advantage is issued a warning or loss of point penalty. Coaches and players shouldn't stand within six feet of the court when the ball is in play. If a team has less than 5 players on the court 10 minutes after the scheduled start time, the first set is declared a forfeit and recorded as 25-0 for the opponent. If a team cannot place 5 players on the court 20 minutes after the scheduled start, the entire match is declared a forfeit with each set recorded as 25-0 or 15-0 for the opponent. In a forfeit situation, teams are encouraged to split up available players and use the remaining scheduled time to play for fun. House matches are allocated 60 minutes to accommodate 3 sets (games). Select and Travel are allocated 90 minutes to accommodate 5 sets. For league standings, the winner of a regular season match is the team that wins the most sets during the allotted time. During the regular season, all 3 or 5 sets of the match are played, regardless of how many sets each team wins. During playoffs, all matches are best 2-of-3 with the decisive third set played only if both teams have won one set. In rally point scoring, every play results in a point being awarded. A serve into the net or out-of-bounds is a point for the other team. Let serves are considered good. 4th-8th GRADE HOUSE SPECIAL RULE: At the discretion of the referee, an extra point is awarded to a team that executes a multi-touch combination that leads to an immediate win where the opponent does not legally return the ball over the net into play. For 4th & 5th Grade House Leagues, ANY two legal touches earns an extra point. For 6th Grade House, ANY three legal touches earns an extra point. For 7th/8th House leagues, three legal touches earns an extra point. However, the third touch must involve an arm swing above the shoulder and can be executed by a front-row or back-row player. 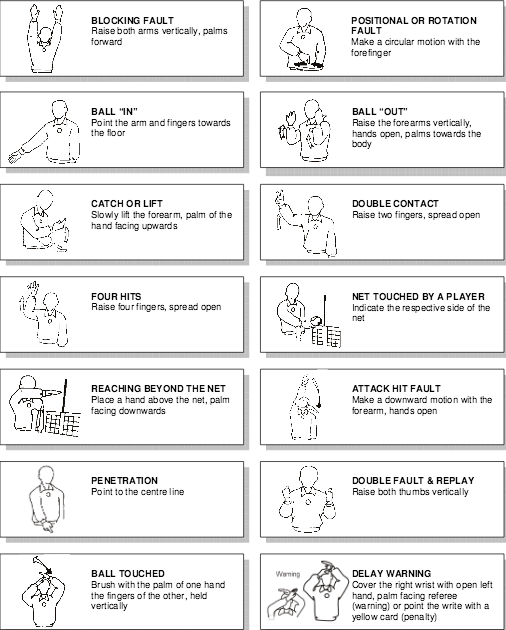 Rolls and tips/dinks are counted as hits, while forearm passes/bumps and two arm hand sets are not. The opportunity to earn an extra point on a multi-touch combination is nullified if the opposing team legally returns the ball over the net and into play. SELECT & TRAVEL LEAGUE RULE: Follows standard USAV substitution rules with the exception of unlimited substitutions per game. For those new to positional substitution, players from the bench can be substituted in for players on the court between points after making a request to the referee. A re-entering player cannot be placed anywhere on the court for a given game – he/she must assume the original position in the serving order in relation to the other teammates (typically for the same player that replaced him/her on the court). Only if a player is injured can a substitute assume a different position on the court, regardless of where he/she substituted before. If a team is using a libero, the coach needs to inform the referee and opposing coach prior to the start of the match. The libero must wear a shirt with colors that clearly contrast with the team's uniforms. A libero is a defensive specialist restricted to performing as a back row player. He/She can substitute in for multiple players in the back row. However, the Libero cannot block or attempt a block, and is not allowed to complete an attack if at the moment of the contact the ball is entirely higher than the top of the net. In one of the six rotation positions, a libero may serve. Servers must always be positioned behind the end line prior to contacting the ball. The entire width of the court is available to the server. A foot on the line at the time the ball is contacted is a foot fault violation and will result in loss of serve and a point for the opposing team. Elementary School servers are allowed to use the modified service line which is 25’ from the net. An alternative service line which is 20' from the net will be available during the first half of the season and should only be used by underpowered players. Middle School servers must serve from behind the 30’ end line. An alternative service line which is 25' from the net will be available during the first half of the season and should only be used by underpowered players.